When most people think of Engergizer they think of batteries, not portable generators. The fact is that they make well-regarded compact generators, which is what we look at today. Is the Energizer EZG1300 right for you? Maybe it is, maybe it isn’t. We also compare it to another great small gas generator, the WEN 56180, to see which one is a better value. Let’s be honest, generators can be confusing unless you’re technically minded. There are a lot of factors to consider before making a purchase. Choosing the right generator size can be tricky. You really have to understand your needs in order to make a wise decision. Hopefully this article will clarify some things for you and help you decide on which generator is best for you. What Size Generator is Right for You? With hurricanes becoming more frequent and more intense, the demand for portable generators is at an all-time high. So while a portable generator may have seemed like a luxury item in the past, it has become more of a necessity for many. You may have always considered a portable generator as something that you’d use for a vacation, perhaps to power your RV or yacht. In times of natural disaster, a portable generator could be the only thing that stands between destitution and having essential power for your electrical appliances. This is even more vital for people who have medical equipment that requires electric power. Ideally, you want 3500 watts or more to keep your home functioning close to normal when it comes to your electricity needs. With prices in the region of $1000 for a top-grade high-output generator, they may be too expensive for many. For really high-powered portable generators, you could end up paying as much as $4000. What if you have only have a few hundred dollars to spend, can you get a reliable portable generator? You can, but you can’t expect a lot of watts for your money. A generator that is way too cheap, is simply not worth it. If you look at your price per watt, you shouldn’t expect to get something of reasonable quality for under 30 bucks per 100W. Paying less will probably mean that you’re buying a generator that’s going to let you down when need it most. There’s no sense in that. The Energizer EZG1300 is well-priced and will provide you with enough power to keep the lights burning and power up a few essential items. You can forget about having enough watts to run a medium to large refrigerator or an air conditioner. For a generator that’s going to give you that kind of power, you’ll need to pay quite a lot more. The size and weight of the Energizer EZG1300 make it ideal for people who rate portability highly. 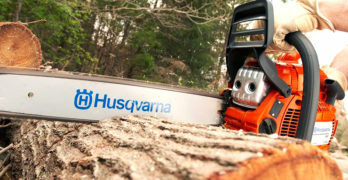 So it’s a fantastic little machine for camping trips or light-duty site work if you’re a contractor. Great little compact gas generator for light-duty power needs. Produces up to 1000 watts of clean 120V AC or 12V DC electricity. Ideal for camping trips, hunting, traveling, tailgating, and light jobs around the house. A large tank size allows longer run times between refills, and Auto-Voltage Regulation keep your appliances safe at all times. Intuitive interface allows you to switch from a 120V Output to a 120V DC Output power to suit your varying applications. Integrated 12V Battery Charging port and charging cable included. The Light weight at only 28kg combined with multiple handling points along the frame make the eZG1300 easy to carry and easy to tie down where necessary. Interface panel is angled upward to provide increased visibility and ergonomics. Quiet running volume at only 71dbA (at 7m). Easy and reliable manual recoil start. ✓ View or download the MANUAL for the Energizer EZG1300. This is a fantastic little generator in its price range and has a very durable engine, as well good basic features. A running load of 1000W and a peak load of 1300W means that you need to carefully consider what you’re going to run off this generator. For keeping the basics running in your home or RV, the Energizer EZG1300 is a good option at a very reasonable price. The Energizer EZG1300 uses a Hyundai HX80 87cc, 2.4HP, 4-stroke engine. Hyundai is one of those Korean motor manufacturers that have taken the world by surprise, producing incredibly reliable engines much cheaper than most of their established Japanese, German and American competitors. This engine is an excellent choice for economy and durability. It’s also quite a large engine for a generator this small, this should mean that it won’t take much strain – reducing wear and tear and, ultimately, increasing the lifespan of the engine. The generator is housed in a durable frame with well-designed rubber feet, this will reduce the vibration levels. When it comes to noise, Energizer boasts proudly of a noise level that’s 71dBA from 7M (23 FT) away. I don’t see this as anything to brag about – 71dBA is loud and for a machine this small, it’s very loud. So I wouldn’t call this a quiet generator by any standard. Fuel consumption, on the other hand, is something that they can be quite proud of. The Energizer EZG1300 has a 1.27-gallon gas tank and this will give you about 9-hours runtime from a tank at 50% load. On the Amazon site, they say that it gets 9-hours at 75% load, the official site says 50%. I’m going to go with the official site, besides 9-hours at 750W, seems unrealistic. This works out to 0.14 gallons per hour, not bad at all. It also has a fuel gauge on the gas tank, which is nice. You start the engine manually, using a recoil starter. I don’t think that you get a generator this small that has an electric starter. The control panel is well laid out and is tilted slightly upward, making it very convenient. The panel provides you with two 120V household power outlets and a 12V battery charging outlet, all with circuit breaker protection. It has a low oil shutoff to protect the engine and your electrical equipment is protected from voltage surges by an automatic voltage regulator (AVR). Voltage protection is very important on a small generator because you’re going to be running it at close to its maximum output most of the time, this is when the voltage is at its least stable and can jump around quite a bit with load changes, an AVR reduces the risk of voltage spikes that can harm your electric equipment. 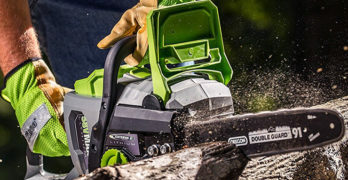 The Energizer EZG1300 is really light, you should have no problem carrying it and the design of the steel frame gives you plenty of positions to comfortably grip the generator. It weighs only 61.7 LBS. Energizer generators a reputed to be well made, durable machines, but I did find one complaint. I’m not sure if this something to be concerned about because I’ve only heard of this from a single customer, so this could be an isolated incident – probably with some kind of external factor. However, I think that it should be mentioned in order to be fair to you. One guy complained about the gas tank rusting. Though like I said, I’ve only heard of this happening once and I wonder if he wasn’t getting water in his fuel somehow. Other than this one complaint, I couldn’t find any reason why you shouldn’t buy this generator. Most opinions reflect that it’s a great little generator and very reliable. The Energizer EZG1300 comes with a 2-year warranty, so it seems to me that they are quite confident of this generator’s quality. I don’t see any emission stats, but I did see somewhere that it only ships to 48 states, this tells me that it doesn’t meet the requirements for the more strict states like California. Visit the Energizer site to learn more about the Energizer EZG1300 and their other fantastic products. WEN always provides great value with their products, including this. Low-oil shutdown safeguards the 4-stroke OHV engine from damage while the spark arrestor permits usage while camping in national parks and forests. Refer to Page No 22 in the User manual provided below for Trouble Shooting Steps. If you have a little extra money to spend, I’d recommend the WEN 56180. I like the brand and they have a solid reputation. In my opinion, this is a very under-rated name when it comes to generator products. 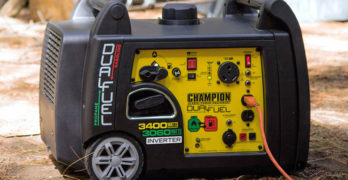 As a manufacturer of off-road vehicle accessories, they have a solid reputation and I can’t see why their generator products should be seen any differently. The WEN 56180 is quite a bit more powerful that Energizer and at this end of the scale a few hundred watts can make a big difference. The Wen 56180 gives you 1500W running power and 1800W of peak power. The running watts on this generator is 50% more than the Energizer EZ1300, this would be my first reason for choosing the WEN over the Energizer. Power is delivered from a 98cc 4-stroke OHV engine and is a decent sized engine for this power output. The WEN engine is also CARB and EPAIII certified, making it acceptable in all 50 states. Fuel consumption is higher than the Energizer EZ1300 at 50% load. Though this should be obvious, it’s pushing out more watts from a bigger engine. The WEN 56180 has a 1.45-gallon gas tank and at a 50% load, this gives you about seven and a half hours of runtime (1.93 gallons per hour). I don’t see any mention of an AVR on this generator. I find this strange because I know that the other WEN generators do have an AVR. Perhaps the fact that it’s not mentioned for this model is an oversight. I would think that it does have an AVR, but can’t confirm this. It does have a spark arrestor, which is great news for people who want to use it national parks with strict fire regulations. It also has low oil shutoff. The power outlets are the same as you get on the Energizer EZ1300 – two 120V outlets and a 12V battery charging outlet. It also uses a recoil starter. I’m much more impressed with the noise levels of the WEN 56180. Despite having a 50% higher wattage output and a bigger engine than the Energizer, the WEN only produces 63dBA from 22 FT away, this is lower than a speaking voice, which makes the WEN much more acceptable in terms of noise. At 50 LBS, the WEN is incredibly impressive in the weight department. It has a similar design to the Energizer, with a sturdy steel frame, yet it’s lighter even though it has a larger engine and alternator. The WEN 56180 also has a 2-year warranty. In conclusion, I’d say that the Energizer EZ1300 is a fantastic generator if you’re on a limited budget. Personally, I’d prefer to spend a bit more and go for the WEN, it beats the little Energizer on every point, except, of course, when it comes to the price. Excellent heavy-duty generator. A great companion during an emergency. Perfect generator for a power outage, emergencies or disasters. 13Kw of power. Provides 7.5 hour run time at half load.